Editor's note: today's posting is in response to a question posed by Meeting of the Minds: How is technology impacting social and economic divisions in cities? We encourage you to see what others are posting today in response to this question. "Strive to expand choice and opportunity for all persons, recognizing a special responsibility to plan for the needs of disadvantaged groups and persons." 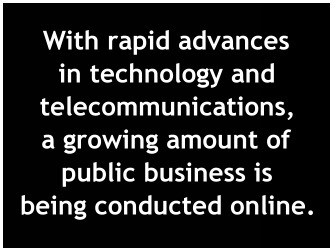 With rapid advances in technology and telecommunications, a growing amount of public business is being conducted online. Planning departments everywhere are scrambling to make it easier for residents and businesses to participate without having to physically attend planning board meetings. More and more planning projects are gathering public input from web sites where residents can identify problems, offer solutions, and even cast votes for ideas they like (or dislike). Take a look, for example, at the “public input web tool” my own hometown of Burlington, Vermont, recently used to gather input for the city’s new downtown and waterfront plan. Or browse through the Engaging Cities planning tools page to get a quick sense of the range of online tools being developed. But planners are rightfully concerned about the "digital divide" and the fact that many members of the community may not have online access. So, why then, do I want to take the next few minutes of your time to talk about public libraries? Aren't they stodgy places, where people come in occasionally to borrow a book or two, or, perhaps, look up some old collections about their city or town’s history. If that’s what you think, you’ve been missing out on a remarkable development: libraries in communities large and small are “repositioning” themselves as the central public hub for providing online access and training to all segments of the community, cutting across age, ethnic, and income lines. Transliteracy. Ever heard of that word? In a nutshell, it means that literacy today is defined by more than just the ability to be able to read. 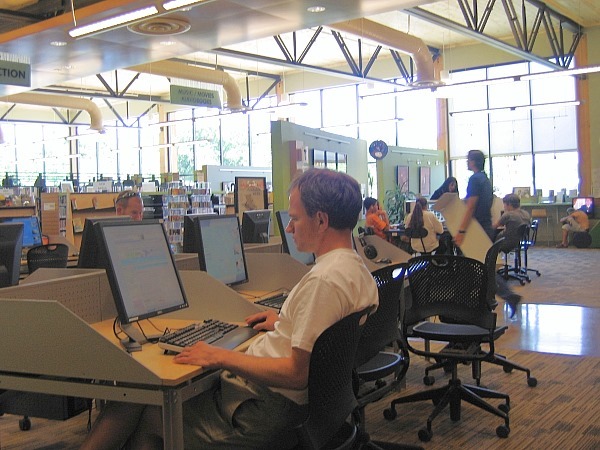 The Pew report found, for example, that 46% of library patrons say they've visited to use a research database. Access to technology ‘petting zoos’ to try out new devices (35% would “very likely” use that service). I’d encourage you to browse through the report’s Executive Summary. The Pew findings are in line with what researchers at the University of Washington Information School found in a 2009 survey of nearly 50,000 patrons of over 400 public libraries across the country. See Opportunity for All: How the American Public Benefits from Internet Access (the report was funded by the Bill & Melinda Gates Foundation and the Institute of Museum and Library Services). “Users turned to computers at the public library for a wide range of reasons, whether it was because they did not have access elsewhere, needed faster Internet speed, wanted technical help from a librarian, competed for access to a computer at home, or simply wanted to work somewhere more peaceful and inviting than a crowded coffee shop or a hectic unemployment office. 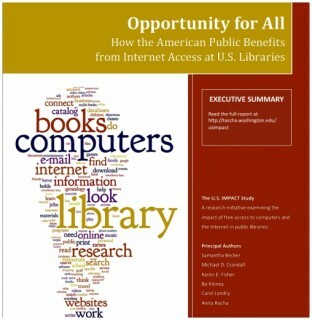 Forty-two percent of the library computer users (an estimated 32.5 million people) leveraged the library technology resources to help them achieve their educational goals. For example, nearly 37 percent of these users relied on library computers to learn about college degree or certificate programs. As Khetarpal told me, youth programs need not be expensive: "Connecting youth to the community via technology can run as a volunteer program or a social enterprise. Youth to provide technology training, and a community partner to provide wisdom and job experience to the youth." Over the past few years, we've also reported in the Planning Commissioners Journal (and on PlannersWeb.com) on the changing role of libraries. 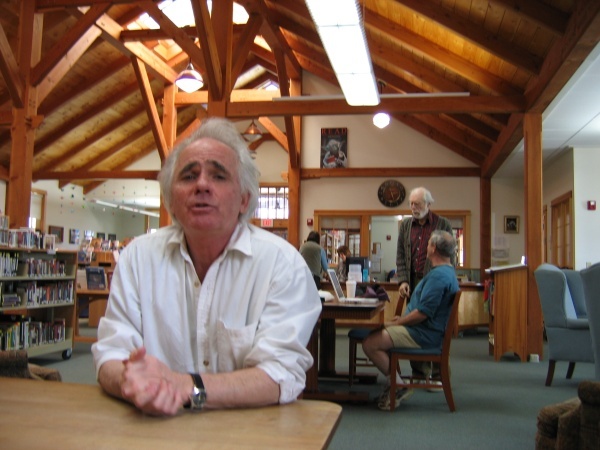 In the small town of Putney, Vermont (population 2,600), public librarian Stephen Coronella told me that over the years libraries have become more multi-faceted. They’re no longer just places to read and take out books (though that’s still a key function). Increasingly libraries are providing a broader range of services, from access to research databases, to loaning videos and CDs, to providing internet access, to offering space for lectures and public meetings. The Putney library regularly attracts one hundred or more people on a daily basis, and forty or fifty more often show up for evening programs. You’ll find people of all ages, incomes, and backgrounds using the Putney library. Its’ seven public access computers are very popular, and offer a valuable service in this rural community where residential broadband service is limited. Twenty-two hundred miles west of Putney, Vermont, you'll find the small city of Moab, Utah, close by the spectacular Arches National Park. The county library, just a block from downtown's main street, is a delightful place. When I stepped inside during a visit several years ago, it was a beehive of activity, with people of all ages engrossed in reading and, yes, in using the Internet. 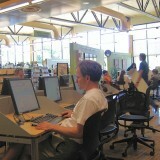 Inside the Moab, Utah, library. In fact, Internet use has been booming. When I followed up with Library Director Carrie Valdes, she told me that online sessions at the library have been rapidly growing. In part, Valdes believes that the economic downturn has led to increased use, especially as more people have been looking to access online job search services. Libraries may well be the single most important civic institution in America today. As scholar Vartan Gregorian (now president of the Carnegie Corporation) has noted, “Across America we are coming to realize the library’s unsurpassed importance as a civic institution. ... In our democratic society, the library stands for hope, for learning, for progress, for literacy, for self-improvement and for civic engagement. The library is a symbol of opportunity, citizenship, equality, freedom of speech and freedom of thought, and hence, is a symbol for democracy itself. It is a critical component in the free exchange of information, which is at the heart of our democracy.” -- from "Libraries as Acts of Civic Renewal" (speech given in Kansas City, Missouri, July 4, 2002). Libraries are also playing an important role in helping integrate immigrants and other newcomers into our communities. As national columnist Neil Peirce reports: “In immigrant-heavy suburbs of Washington, D.C., many public libraries have recast themselves as welcome centers. Some checkout desks have signs in Korean, Chinese, Spanish and Vietnamese. A recent immigrant from the Dominican Republic said: ‘I come to the library almost every day. And two days a week I follow the conversation classes. We have the opportunity not only to improve our English but to get new friends from all over the world.’ ” Libraries and New Americans: The Indispensable Link (April 13, 2008, for The Washington Post Writers Group) . See also a fascinating blog about the Hartford, Connecticut, Public Library’s immigrant outreach programs. The bottom line for planners is this: if we’re interested in engaging citizens from all segments of our community in using innovative online planning tools, planners need to connect with their local librarians so each is aware of what the other is up to. Make the public library part of your planning universe. Some of the material for this posting draws on Editor Wayne Senville's Planning Commissioners Journal article, Libraries at the Heart of Our Communities (for a limited time, a free pdf of this article is available through this link). Note: the article also focuses on the economic benefits of having libraries located in downtown districts. "A Harbor You Can Sail Into"
While this posting focuses on libraries & online access, the aim of many librarians today is to make their library a community "third place" where people from all parts of the community can converge for discussions, talks, research, and, yes, even reading. 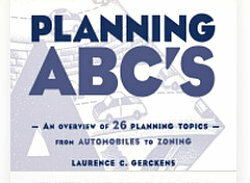 For more on this, see a talk by Leslie Burger, Agoras, Forums, Living Rooms, and Libraries. 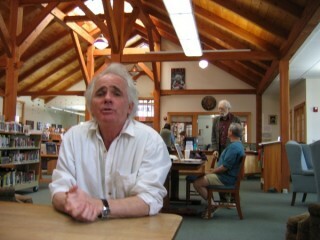 Burger is Executive Director of the Princeton Public Library and a past-president of the American Library Association. The heart of her talk starts 9 minutes into the video (which is the part of the video our link is set to).